You may have already heard about Thornham Marina’s new tenant Lone Twin who are embarking on an innovative project called ‘The Boat Project’. They are building a beautiful 30ft sea-faring vessel from wooden objects of personal significance to the people and communities who have given them. Check out their website, www.theboatproject.com for more information on open days to donate your wood, and see how you can you be a part! Here are the pictures of last weeks free prize draw winners, Mr Wilson - Yacht Lobo. It was a great, & welcome, surprise to win this years free winter storage in your draw. The refund will allow us to carry out some much needed work on LOBO, using several small business enterprises located in the yard. 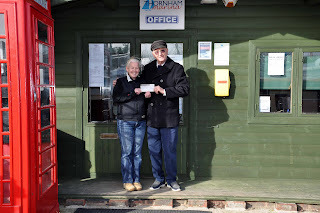 We shall also drink a toast to all the staff at Thornham Marina for the service they have given us over the years. Arriving to lay up each winter feels like coming home, looking forward to the humour & efficiency with which they carry out their work. Having used several yards in Chichester harbour, I can honestly say that Thornham is the friendliest. Check back next week for pictures of our other lucky winners, Mr & Mrs Lucas - Yacht Moonshadow! To be in with your chance of winning, book you winter storage at Thornham Marina now! Call Courtney on 01243 375 335. Boats have a life, a mind of their own, once named & christened. 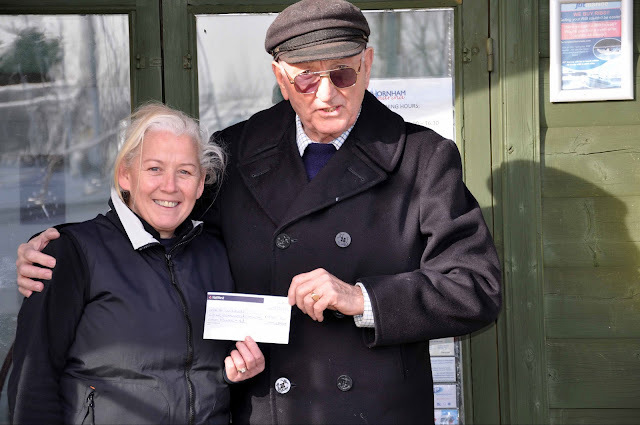 For those of you that have signed up to our website, you will receive a regular email from us keeping you up-dated about what’s going on at Thornham Marina and interesting marine related articles. Our latest email that popped up in our readers’ inboxes was; ‘How to Change Your Boat’s Name without Tempting Fate’. This is just one of an age old tradition. Nautical Superstitions travel so far back in history that their true origins get warped as they are passed down from generation to generation. Most Nautical Superstitions roots derive from the consideration of safety and wives tales. Thank you for your advice on changing a boats name. Can I add, I own a yacht that had her name changed by the second owner and he died on the saloon floor in a force 6 in the Solent. I knew this when I purchased my 41 ft sailing yacht from the broker and looked deep into ceremony of renaming a boat and I have no reason to doubt that he being a God fearing man would have gone with Tradition. But as I did not get any logs books with the Yacht just bills of sale, reg docks, all previous sale documents and all the handbooks for all the equipment on board it took a bit of digging on the internet to find the information. I took possession of my yacht on the 1st day of January 2007 but paid in full between Christmas and the New Year 2006. Through the Brokers the widow contacted me and asked if she could say goodbye to her husband on the yacht on New Year’s Eve, I agreed and the Widow and her Daughter said goodbye in a private moment, (with the yacht still on the hard), I believe the party came off the yacht after midnight. I know the previous owner loved his yacht and was looking forward to retirement so he could cruise further afield and had done lots of improvements, had written lots of information on the internet and was a jovial happy man who was well liked and successful from a very professional background and family. I purchased my Yacht on the hard and decided to copper coat the underside which I duly did, the God gave me a weather window in February with 11 days of 12O to complete the job and check her for sea trials. On the last night aboard on my own still on the hard, I cooked dinner for two, dressed the dining room table with two place settings and two wine glasses and cooked dinner 2 nice sirloins in red wine and pepper and cream sauce garlic and herb potatoes and roasted vegetables before Martin (previous owner) and I sat down for dinner I talked to him aloud and toasted him as a friend and as a ghost, followed by lashings of Scotch. We have owned his renamed yacht for three years, I try never to take risks that might endanger anybody including myself and can say our yacht has sailed through rough conditions and I have always felt very safe, I have never changed any of the lettering on the stern nor will I ever in my ownership. The first trip to our home port started well with watery sunshine and a reasonable forecast, me being a Pilot it's the first risk assessment! Headed past the Needles past Bramble bank direct into wind with the tide with us, so it was getting choppy! Not rough! As the bow buried deep into the waves and the sea gushed back to the spray hood then past the race and out into the channel autopilot on set to a heading for the far marker just as we were reaching that area the autopilot turned off and we were caught in a whirlpool round we went in a circle 360 deg wow! Full power and away!!! And out! Reset the autopilot and headed for Poole. Rain, a bit of sunshine, waves started to abate but still into wind heading for Old Harry and home! Three years of trips, adventures winter and summer, great boat. Please click here to read the full article on How to Change your Boats Name by Capt. Pat. Another popular marine superstition is women onboard are considered very unlucky. Women were often forbidden from sailing on military vessels. They would be allowed on merchant ships, but this was decided by the captain. Some say this is because women were considered bad luck, and that having a woman on board a ship when it was at sea would anger the sea gods, bringing on horrible weather and rough water. In some cases women who were on board ship were even tossed overboard in order to attempt an appeasement of the gods. As you can imagine, Jeanette highly disagrees with this. She said ‘I have had one unfortunate incident whilst on board but I believe woman to be very lucky onboard and as far as not sailing on military vessels, Jeanette spent 21 years in the British Army and sailed on lots of military boat’s. 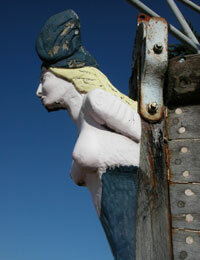 However, having a figure of a bare breasted woman on the bow of the ship was thought to calm the seas. It was believed to ‘shame nature’ therefore keeping the storms away. It seems like to me having a woman on board would only be a distraction to male sailors on long voyages causing them to go off course and give their Captains extreme headaches. If you have any marine superstitions or have anything ‘unlucky’ that has happened to you whilst aboard a boat please send your stories and superstitions in to info@thornhammarina.com and I will publish them on next week’s blog.